Yesterday, Governor Jon M. Huntsman, Jr. of Utah signed into law legislation that makes homebrewing beer legal. The “Exemption for Alcoholic Beverage Manufacturing License” was sponsored by Representative Christine A. Johnson and made Utah the 46th state to legalize homebrewing. The US Government made homebrewing legal on a federal level in 1978. Since then all but four states; Alabama, Kentucky, Mississippi and Oklahoma have made homebrewing legal. 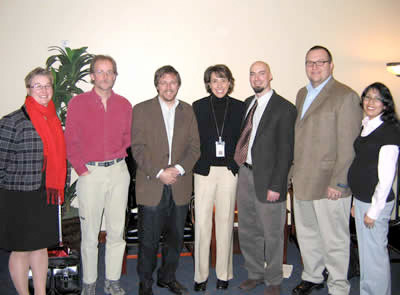 From left: The Jamie Burnham, Beer Nut manager; Allen Sanderson, AHA member; Mark Alston, The Beer Nut Owner; Christine Johnson, Representative; Gary Glass, AHA Director; and AHA members Douglas Wawrzynski and Nicole Salazar. But it’s not just homebrewers who are excited about the change. Jennifer Talley, brewmaster for Squatters Pub Brewery/Salt Lake Brewing Co in Salt Lake City, says the relationship between professional and amateur brewers has always been a tight one and legalizing homebrewing will allow this relationship in Utah to evolve and grow. “Homebrewing is truly an art and most professional brewers I know were once homebrewing in their kitchen. Utah beer enthusiast will now have the freedom to express their deepest beer desires through perfecting the craft of homebrewing in their own kitchens,” says Talley. The American Homebrewers Association estimates that there are approximately 750,000 homebrewers in the United States, including 7,000 homebrewers residing in Utah. Utah is the only state to have legalized homebrewing in the last ten years. There is currently an active movement to legalize homebrewing in Alabama, and the AHA has heard from homebrewers in Kentucky, Mississippi, and Oklahoma who are interested in starting movements in each of those states. There is an error here….. Believe me Homebrewing is alive and well in Oklahoma and has been for years! Randy Burleson suggests that homebrewing is legal in Oklahoma. Well, while there are many homebrewers there and there are even homebrew supply shops (nothing illegal about selling malt, hops, and yeast) – that’s true of Alabama, Kentucky and Mississippi as well – it is indeed not legal to homebrew in Oklahoma. There is no exemption to the licencing and taxation required by Oklahoma statute for brewing beer at home. these last hold out states need to get with the program!!!! About time Utah came to its senses. Hopefully this will be the beginning of the end of 3.2 beer in that crazy state. Relax Gary! I think Randy Burleson was being sarcastic. He never said it was legal in Oklahoma just alive and well. Just have a homebrew and enjoy the passing of HB51!! therefore, Gary’s analysis of the comment was correct. I also say, hold up a pint and congratulate all the states on the push forward on great craft brews! Brew on!! !